The growing Canadian banner is marking its fifth anniversary by opening an L.A. office and boosting its production arm. A growing film development and production slate has Canadian sales group Double Dutch International going Hollywood. 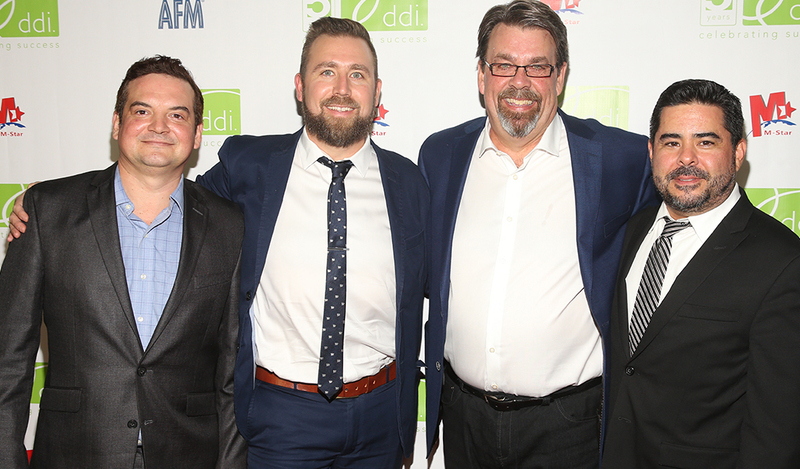 Toronto-based DDI, this year celebrating its fifth anniversary, is attending AFM armed with considerable momentum after opening a Los Angeles office and moving beyond the international indie film business to become a global sales company with an expanding production division. "We’re not just the international sales side anymore. We’re hands-on with the domestic release in the U.S., because it has such an impact on what happens internationally," company president and CEO Jason Moring tells The Hollywood Reporter. DDI is building on its momentum as a sales company with quality titles like the Emily Dickinson biopic A Quiet Passion, starring Cynthia Nixon, and Brad Epstein’s Ripped, a stoner buddy comedy starring stand-up comedian Russell Peters alongside Faizon Love. "Russell has a massive global fan base, and matched with the strong appeal for buddy comedies, Ripped is sure to deliver,” says Moring. Plus, the Canadian company is expanding on the production side, helping indie producers finance and develop film projects. DDI recently hired former Myriad Pictures executive Mark Padilla as senior vp sales and acquisitions and Stanley Preschutti as director of film finance and development, with both based in Los Angeles. Padilla has taken control of the film sales side of DDI, allowing Moring to focus more on fundraising. Preschutti, meanwhile, is vetting film projects that come DDI’s way, ensuring that the packaging elements are firm to allow additional financing to fall into place. “Once we’ve opted to participate in a film, Stan helps bring the remaining financing to the table and works with casting directors, and he’ll oversee the producers and the budget,” says Moring. To make movies with U.S. commercial potential across all media platforms a safer bet for foreign buyers, DDI has lined up a $50 million P&A fund from private wealth management firm Fleet-Fairhaven. “When you’re asking for the bigger dollars, there’s a focus on the U.S. market. And if we can’t control that, it makes our job very difficult at the international stage to get buyers committed to where we want them to be,” Moring explained. The idea is getting more dollars behind a film’s marketing campaign to drum up buzz for the domestic release and not see the P&A funds wasted elsewhere. “There’s definitely a trend where, when you’re spending print and advertising funds, more money needs to go into the consumer marketing than is actually being spent,” Moring says. “Those wasted administrative costs don’t help market the film to consumers, who drive the revenue back to the film." With fewer buyers and lower prices for all but the biggest indie titles, many indie film players have shifted to more mainstream fare to stay competitive, a trend DDI is following as well. Typically, movie titles that come to DDI tend to be at the script stage, with the project having a director or producer attached — and not much else. DDI helps structures the equity and brings P&A to the table and handles global sales. And as many U.S. indie and foreign titles have struggled to snag and hold on to theatrical screens, DDI is keen to do bigger projects with bigger names and significant P&A that it then represents for worldwide sales. The trick, Moring says, is to bringing certain pieces of the financing and casting puzzle to a project early on to give DDI an advantage with foreign buyers. “A lot of the projects DDI is getting involved with starts with our asking, ‘Do we believe the film can go on at least 1,000 screens in the U.S.?’ We start from there to start to build our interest level internationally,” he says. The focus on the U.S. market is deliberate as the world still looks to see what Americans do with a release, Moring says. “Everyone has their eyes glued on what’s happening in the U.S. — which distributor is attached, what’s the screen count and what’s the P&A,” he says. “And if we can’t control that (U.S. release), it makes our job very difficult at the international stage to get buyers committed to where we want them to be.” Another key contribution from DDI is helping with casting to ensure that movies that the Canadian company backs have the most effective impact with foreign audiences.A case in point is A Quiet Passion, where Moring brought financing to the table ahead of a festival run that started in Berlin and included stops in Toronto, San Sebastian, London and New York. Super Troopers 2, the follow-up to the 2001 cult hit, is typical of the type of mainstream movie with box-office potential that Double Dutch is increasingly backing these days. The sequel, with DDI handling international sales, once again features the Broken Lizard comedy troupe of writer-actors Jay Chandrasekhar, Kevin Heffernan, Steve Lemme, Paul Soter and Erik Stolhanske, and now Rob Lowe has come along for the ride. An Indiegogo crowd-funding campaign saw producers raise $4.4 million to make the second film, surpassing its $2 million goal. The original grossed a surprising $18.4 million. “Super Troopers 2 has a lot of publicity behind it, as the original was a mega-hit for Fox Searchlight,” DDI president and CEO Jason Moring says. “The crowd-funding campaign was second only to that of Veronica Mars.” Fox Searchlight once again has North American rights to the movie, which was first introduced to foreign buyers at Cannes in May. It recently wrapped production in Boston.